Only one Lane Steam Wagon was produced, despite plans to continue manufacture. The 6-passenger vehicle featured such safety controls as a self-closing throttle. The Lane was cumbersome at 3,200 lbs., however, and only able to achieve a speed of 15 mph. It was a dual-purpose machine and could be used for passengers or to carry merchandise. 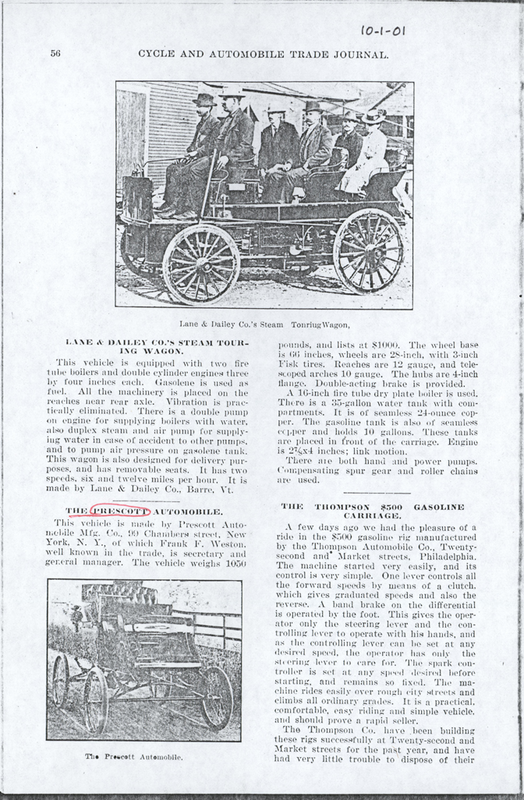 The Lane and Dailey Company of Barre, VT built a "Steam Touring Wagon" that warranted editorial space in the October 1901 issue of Cycle and Automobile Trade Journal, p. 56. It shared page space with the Prescott steam car. John A. Conde Collection. Contact us if you have additional information about the Lane and Dailey Company, or if you have questions.